The centre point of this 'traversée de Paris' poses no problem of identification. The letter de Valen received from the kidnapper specified the place - 'Quai d'Orléans, by the ramp leading down to the river' - and the rendezvous sequence was clearly shot at that place on the île Saint Louis (a view of Notre Dame is included in case there was any doubt). But the beginning and end points of this journey are more problematic. Even given how a building's appearance can change over 100 years, this does not look like the place from which de Valen sets out. The arch of the door is sizably different, the building is not on a corner, and there is no wooded area nearby. This building is not too different in type from that of the address given, and to find it might feasibly entail examining others in the vicinity, perhaps those on the corners of streets adjoining the tree-lined Avenue Foch, just south of the Avenue de la Grande Armée. Such an examination proved fruitless, however, and if I wasn't to visit every street corner in every elegant district of Paris, I needed to take a different approach. These are all the same building as in L'Enfant de Paris. Among the identifying details are: the shape of the doorway, the elaborate moulding above it, the metalwork of the door itself, the facing on the walls, the decoration above the windows, the type of grating below them, and the incline of the street. This result shouldn't surprise us. My search for locations in Gaumont films from between 1906 and 1917 has turned up around thirty different uses of locations in the vicinity of the studios, and I have only examined a very limited corpus (those films that are available on dvd, such as the two boxes of 'Le Cinéma premier' issued by Gaumont in 2008 and 2009). Despite certain similarities, this cannot be the gateway in the film because the terrain immediately beyond the gates is flat. But the obstacle to identification here is the architecture. 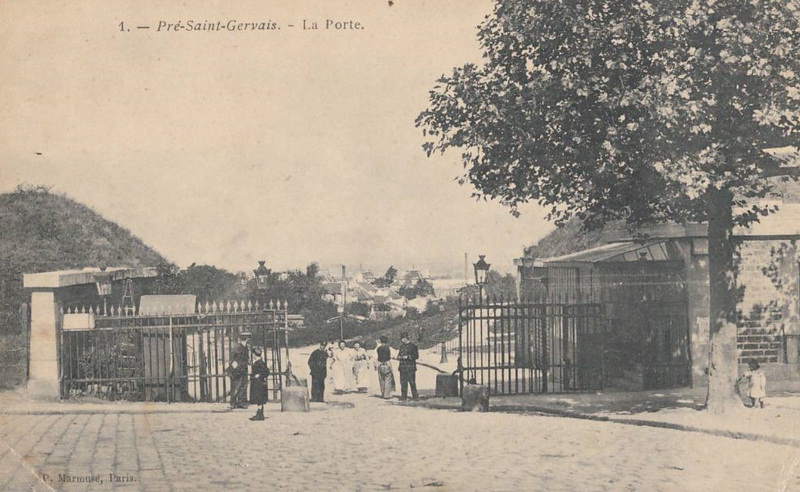 This postcard was sent in 1906, and the building shown, a 'maison de gardien', is still there today. It is not the building visible in the 1913 film, and none of the other entrances to the park has by it a building like that in the film. The railings and lamp posts are the same, but shown from a different angle. The Porte d'Allemagne, or Porte de Pantin, is in the same arrondissement as the Gaumont factory. The earthworks of the fortifications are recognisable, as is the type of bollard on the ground. 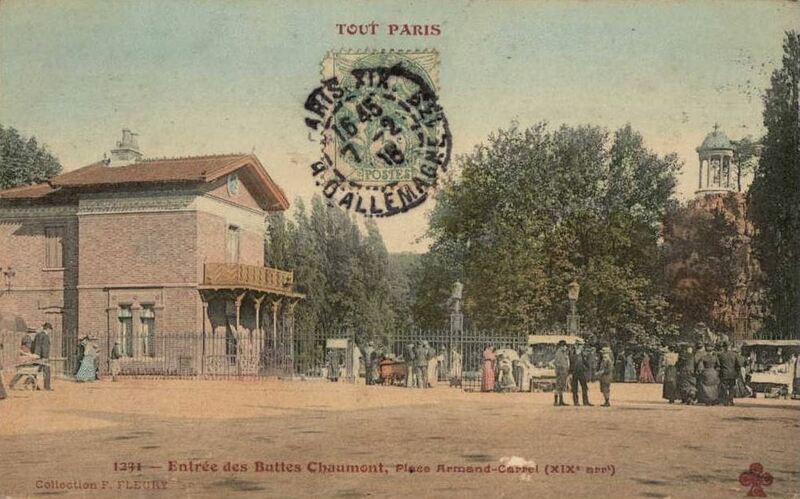 The pattern of stone and brickwork on the building at the extreme right of the postcard is also similar to that of the building in the film, but the layout of pavement, bollards and lamp posts is not quite right. This is not the entrance that we see in the film, but it is certainly an entrance of this type that we see. This, I think, is the right porte. 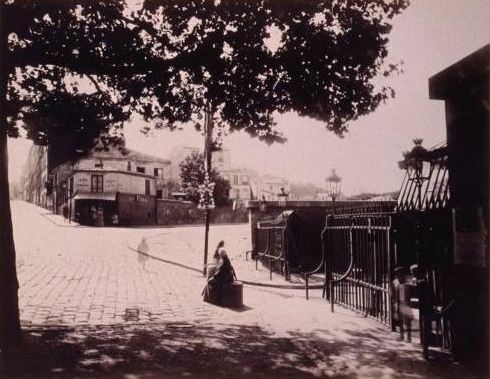 Only the shot in Judex corresponds to the direction of Atget's view, and it isn't from the same angle. Moreover, even if the registering of distances by the two cameras is necessarily different, the bollard on which the woman is sitting in Atget's photograph seems to be further forward than the bollard in Feuillade's film. 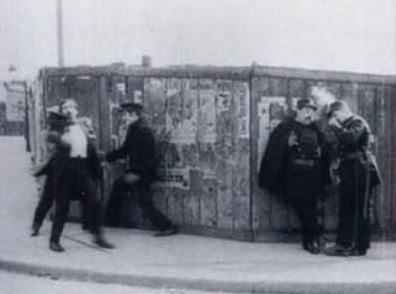 Also, there is a wooden construction on the fortification wall in the film that we cannot see in the photograph, but it is a distortion that makes us think that the portion of wall we see in the film is the same as that in the photograph. In fact, with the film camera almost in front of the gates, it doesn't show the stretch of wall shown by Atget, so the wooden construction is not an indicator. I'm inclined to find the evidence so far conclusive, but there is a last piece from Judex. 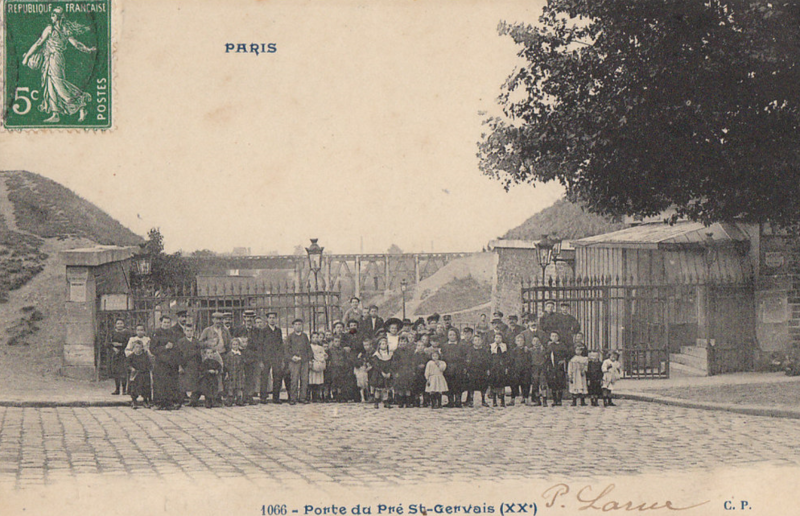 After the wagon crosses the barrier into Paris, the next shot shows it pulling up at a café. The café is very similar to the one we see in the background of Atget's photograph. Both have a striped awning, and on the left side of both can be seen a hand rail. If this is the same café, the wagon in Judex is not approaching it from the right direction, since it is supposed to have just entered by the gateway, but I have not found many films of this period to be concerned with matching movement to the actual (as opposed to the perceived) topography. 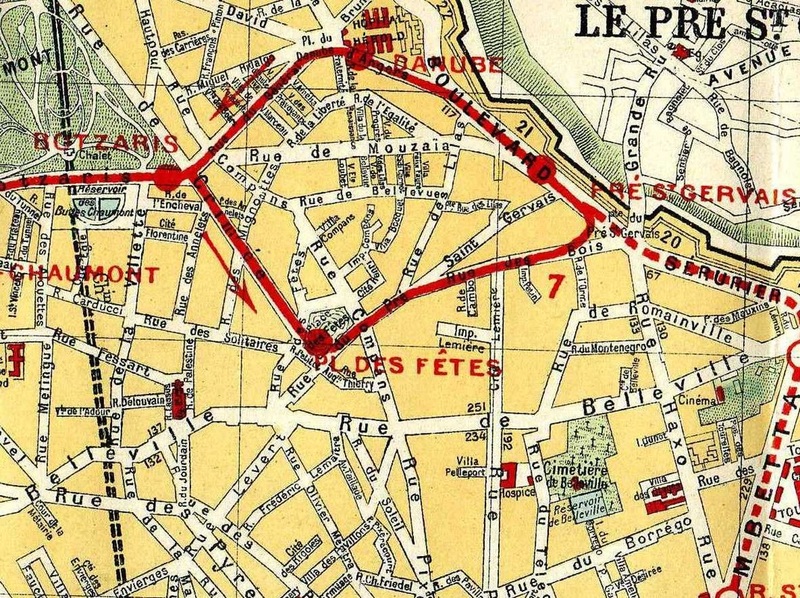 The identification of the entrance into Paris is of a different order from the identification of de Valen's home, where a building in one part of Paris passes for a building on the other side of the city. The deception, or fiction, regarding de Valen's address is determined firstly by semantic over-determination (this military hero has to live in the avenue of the 'Grande Armée') but more importantly by a topographical differentiation in the narrative. His journey across Paris is a journey across social divides, down through social strata, a movement conveniently expressed here (as in many other films) as a passage from west to east. The street in L'Enfant de Paris is characteristic, but not easy to locate. 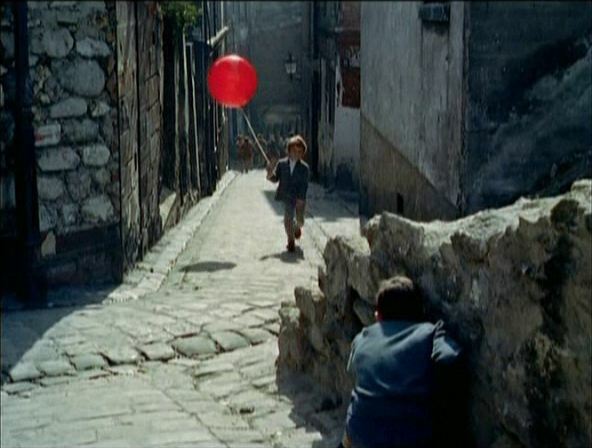 In the film, the hero Le Bosco runs twice from here to the Pré Saint Gervais gateway, and the cut each time suggests that the two places are contiguous, but since on the first occasion he runs offscreen left and on the second offscreen right, each time ending up at the gateway, it is clear that the topography of the film is not coherent in its own terms, never mind coherent in relation to the actual topography of Paris. But there is no reason for the post office or café actually to be near each other (they are separated in the film by a cut), nor for either to be near either where the villain is said to live or where he is shown to live. 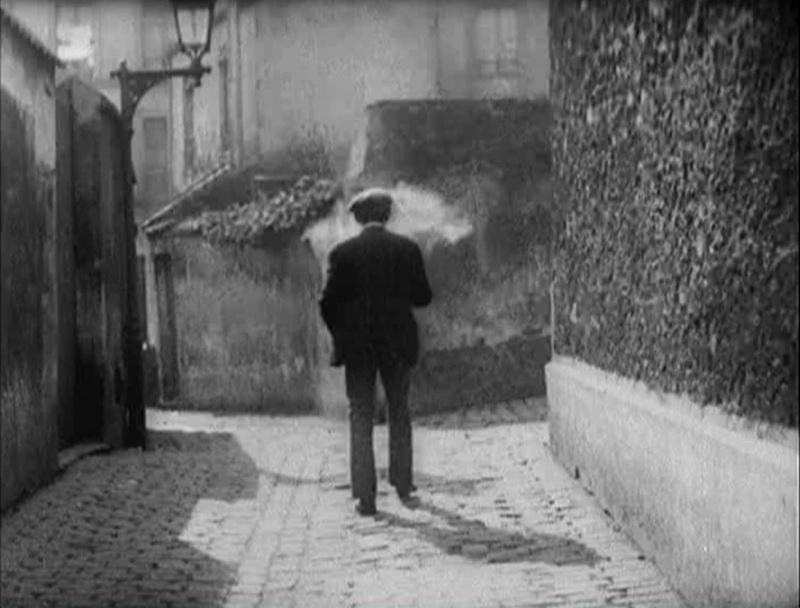 Les Agents tels qu'on nous les représente et les agents tels qu'ils sont (Feuillade 1908) -still taken from David Bordwell's Figures Traced in Light. There is a nearby alternative, but about which I know very little. 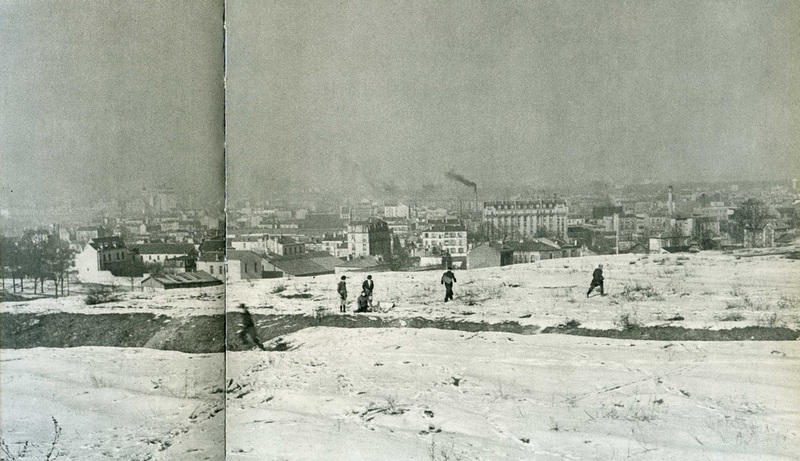 To the west of the southern tip of the Parc des Buttes Chaumont is another hill that had been quarried for gypsum but which, unlike the Buttes Chaumont, had not been reshaped in the 1860s into an elegant park for the people. (More exactly, it had formed part of the same 'butte' as that of the park, but was separated from it in the course of the park's creation.) Known now as the Butte Bergeyre, it corresponds to the area below marked 'Folles-Buttes'. 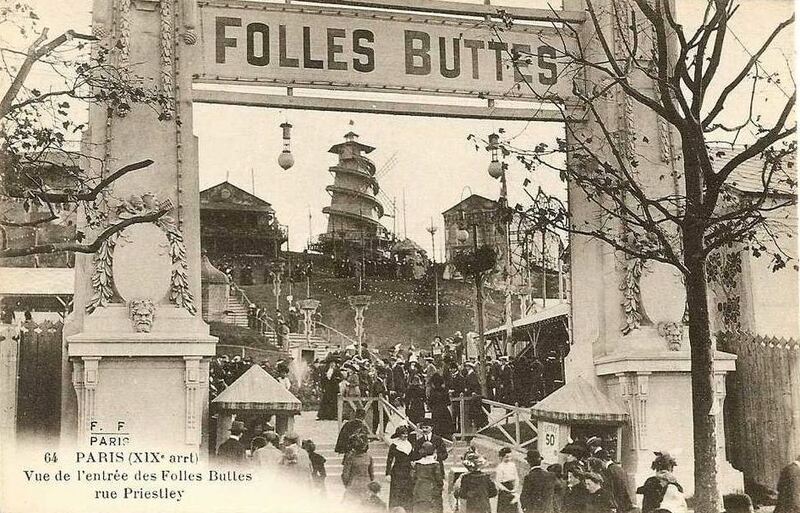 With no photographs of what the place looked like before 1914, I am only guessing that it might have been one of the places in which Gaumont filmmakers had their actors roll comically down slopes. The combination of grassy earthwork and walls behind the Apaches and behind Onésime is very familiar. They can only be fortifications of the kind we have seen earlier near to the various gateways into Paris. I conclude, then, that when Gaumont filmmakers needed open space in which to film comical tumbling, they had three immediate options: the Parc des Buttes Chaumont; the 'Folles Buttes' (or whatever they might have called it circa 1907); and the stretches of wasteland around the fortifications, perhaps above all towards the porte du Pré Saint Gervais. In perhaps his most affecting photographs, Atget documented the spaces occupied by these marginals, and also their faces and demeanour. He published his work on the 'zoniers' in 1913. 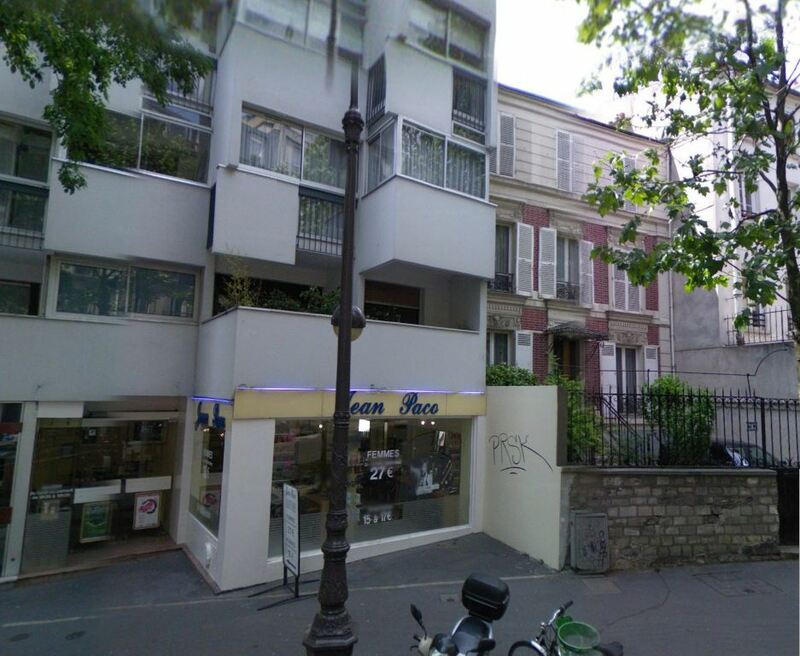 Unlike an elegant apartment building on the Avenue de la Grande Armée or a narrow back street somewhere in Ménilmontant, the 'zonier' dwelling documented here by Perret is beyond further identification. We can only know what kind of thing it was, in what kind of place it could be found, and what kind of people lived there (and that they weren't arch-criminals like Le Bachelier, here pictured). The zone is, for those of us obsessed with identifying and interpreting the places we see in films, a non-place: un non-lieu. 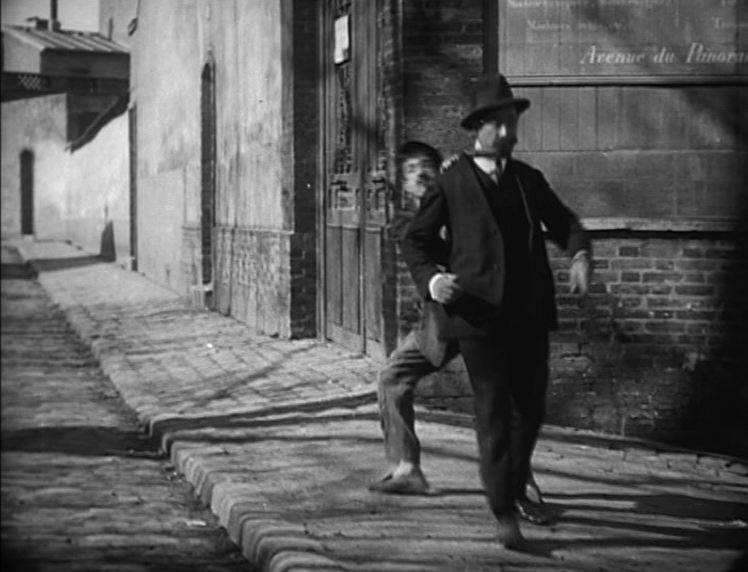 The film L'Homme aimanté is listed as 'filmmaker unknown' in the Gaumont box set, Le premier cinéma 2, but Francis Lacassin in his book Louis Feuillade: maître des lions et des vampires (1995) makes it clear that the film is by Feuillade. Most of the films mentioned in this piece can be found on those two box sets issued under the title 'Gaumont: le cinéma premier', Volume 1: 1897-1913 (in 2008) and Volume 2: 1907-1916 (in 2009). For Judex I referrred to the 2004 Flicker Alley edition, and for Les Vampires to the 2005 Image Entertainment edition. 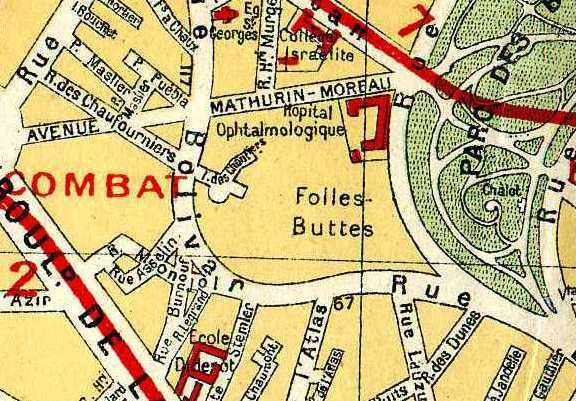 The maps I have used are Google Maps and a Nouveau Plan de Paris published by Hachette in 1917. The full set of Atget's 'zonier' photographs can be viewed at Gallica's Bibliothèque numérique. The postcards used as illustrations were found on collector sites such as CPArama and delcampe.net. 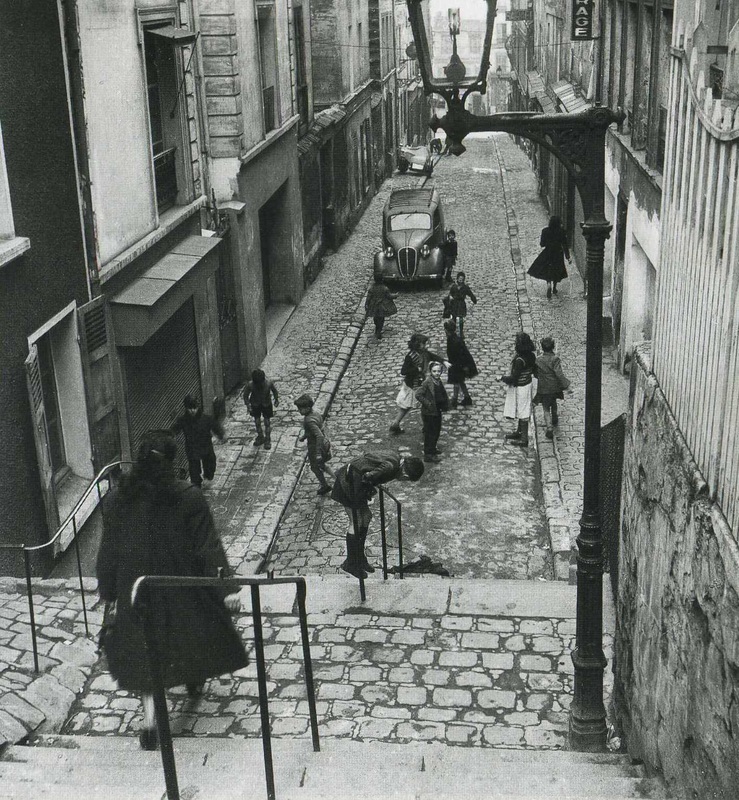 To find out more about Belleville-Ménilmontant, visit the ​Rue du Pressoir.